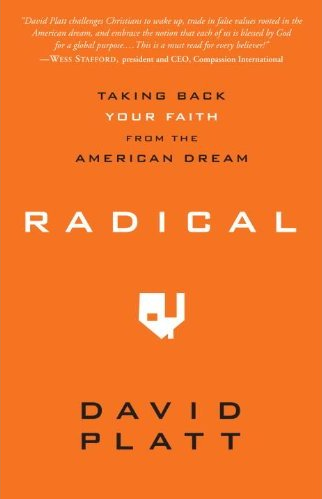 I have been reading the book Radical by David Platt it is an excellent book that answers the question, why following Christ means being so radical? This is one book I wish I had written myself, but that you need to dig into yourself. Followership is radical. We are not talking about Christian jihad or political-far-right, but being a follower in a passive and putrid American society is risky. Jesus calls us to a lifestyle that is active and living, and revolving around Himself. The cost of committing to Christ is radical and means I must abandon all my American dreams for him. Jesus asked me to leave behind security, money, a life of ease and even those that I love the most to be His follower. That sounds radical. That is exactly what this book is about. Followership is more than believing in Jesus, it is also obeying Him. Jesus wants to change me and culture from the inside out, not from the outside in. I am ready to take The Radical Experiment. To find out more about this one-year journey to authentic followership you will have to just read the book. David Platt, Radical, Waterbrook Multnomah, Colorado Springs, CO. 2010.